Most-Trusted Telecom Brand Bharat Sanchar Nigam Limited (BSNL) on occasion of Festival season Introduced Special Tariff Vouchers with attractive tariff and Full Talk Value offer under GSM Prepaid Mobile Services across Kerala Telecom Circle as promotional basis for limited period. 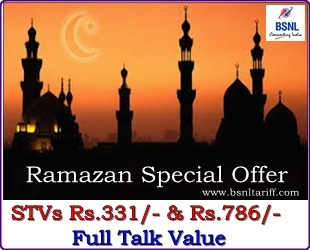 The Special Tariff Voucher of Rs.313/- offers, Full Talk Value which is equal to MRP and 7.8/Minute Voice calls to Bahrain, Kuwait, Saudi Arabia and UAE countries with validity for 30 days. The Special Tariff Voucher of Rs.786/- offers, Full Talk Value which is equal to MRP and 7.8/Minute Voice calls to Bahrain, Kuwait, Saudi Arabia and UAE countries with validity for 90 days. By using the above Festival Season offer Special Tariff Vouchers offer, BSNL Customers can call their near and dear with cheap rate voice calls. The above offer will be implemented and with effect from 06-08-2013.